This heavy-duty engine stand has a 907 kg. capacity, and its compact design saves an incredible amount of space. The RES-1TF 1 ton (1-mt.) capacity engine stand is all about functional convenience. When you need it, it's right there to lend its helping 360° swivel claw. When you're done, just fold it up and put it in a corner, where it will wait patiently until called upon again. The RES-1TF features a sturdy, wide-base design to prevent tipping under load, and the front swivel casters let you position the engine exactly where you need it. The neck is reinforced to eliminate flex while the slotted adjustable saddle permits quick and easy installation. But, the most important thing to know about the RES-1TF is that it's a true team player. 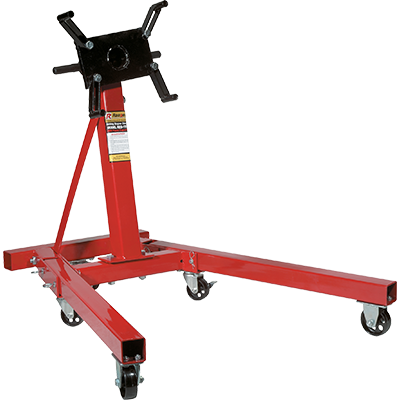 Unlike other hulking pieces of shop equipment that constantly make their presence known by getting in your way, this engine stand gets the job done and then gracefully fades into the background of the garage. Make the RES-1TF a part of your team today.